Children grow so quickly that often recently bought in an expensive shop or a memorable journey clothes already bursting at the seams when you try to pull it. And this is almost an ideal state of things! 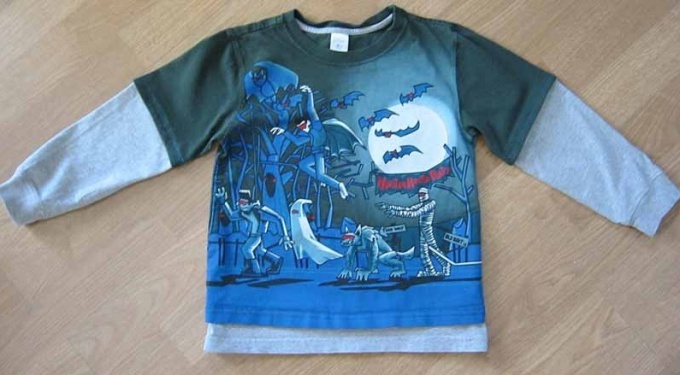 If your child grew out of favorite t-shirts and does not want to part with it, you may want to give it a second life. The tee will benefit from the incident with her transformation. It will last a season, if you pick up the most problematic areas of the shirt – sleeves and length of the product. Lay your favorite shirt (let's call it main) which needs to be lengthened on the table. Attach it to any shirt (a size which is your child) with short sleeves. Align the openings of t-shirts and mark hem line short sleeves basic t-shirt. From the new line of the bottom of the sleeves add two inches for seams. Do the same on the second sleeve. Cut off the excess length sleeveless basic t-shirt tailor's scissors. Measure the child's arm you need a new sleeve length. Measure on the main t-shirt new (cropped) sleeve length excluding allowances and subtract this amount from the total you have measured the necessary length sleeves. You got podkralas length of the sleeve, whereby you extend the basic t-shirt. Place the second prepared t-shirt, which you will need to cut the sleeves and bottom. Measure from the bottom of each sleeve received in the previous step-size, draw a line and add two inches for allowance. Cut parts of bags from unwanted shirts. Put podkralas sleeve short sleeves basic t-shirt, folding the parts wrong side together. Align the seams of the sleeves and their sections. Tuck allowances inside each part, you will need to make a bent edge podkralas details was a couple millimeters below the fundamental, then in finished form from under the short sleeves basic t shirt will not be visible to the second layer of fabric. Pin details round pins and prostrochite on the sewing machine, stepping back 1 cm from the edge. Thus, the sections of both parts of the sleeve will be inside. Treating them is not necessary, because the fine knit will not Ravel. Sewn to the parts of the sleeves looked a bit alien, they can be maintained, sew to the lower edge of the main shirt cut off part of the bottom of the second t-shirt. It will also lengthen a too short shirt. Cut the bottom of the shirt, the sleeves of which you've used to increase length sleeves basic t shirt. The height of the severed part determine and measure the required overall length along the back of the child and subtracting from it the length of the main t-shirt. Make a seam allowance of 2 cm, take a break. Fold the allowance of the items received on the wrong side and fold it with the lower part of the main t-shirt wrong side so that the processed edge basic t shirt 1 cm beyond the edge podkralas details with bent stock. Pristrochite parts to each other, paving the stitching in the seam of the bottom hem of the main shirt.